shirt of this October’s MCM London Comic Con. Created by our geek chic friends Genki Gear, this exclusive limited edition tee is the perfect platform for retro gaming horror – featuring a silkscreen design printed onto a 200gsm short-sleeved T-shirt. Available as a unisex or women’s fitted T-shirt, it is priced at £16.99 with pre-orders closing on 17 October. You can either pick up your tee direct from Genki Gear’s stand at MCM London Comic Con itself or have it posted to your home in plenty of time for Halloween (27th October). To order your T-shirt and check out Genki Gear’s great range of geek-tastic clothing, visit www.genkigear.com. 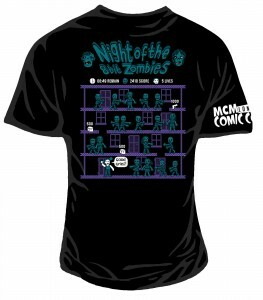 If you’re planning to collect your official MCM London Comic Con shirt at the show, you can also order it from MCM’s store at www.mcmexpostore.com.